Charles Sanders Peirce was a scientist, philosopher, mathematician and one of the founders of modern logic. Among the logical innovations attributed to him are quantification (independently of Frege), three-valued logic and a comprehensive system of existential graphs. At the same time, Peirce had an exceptionally wide conception of logic as the normative science concerned with the goodness of belief, inference and scientific inquiry. The purpose of this symposium is to discuss and evaluate Peirce's logical and philosophical ideas in contrast and connection with developments in logic and analytic philosophy that simultaneously and consequently took place in Europe. The European thinkers of special interest to the symposium include Rudolf Hermann Lotze, Gottlob Frege, Edmund Husserl and Frank Ramsey. 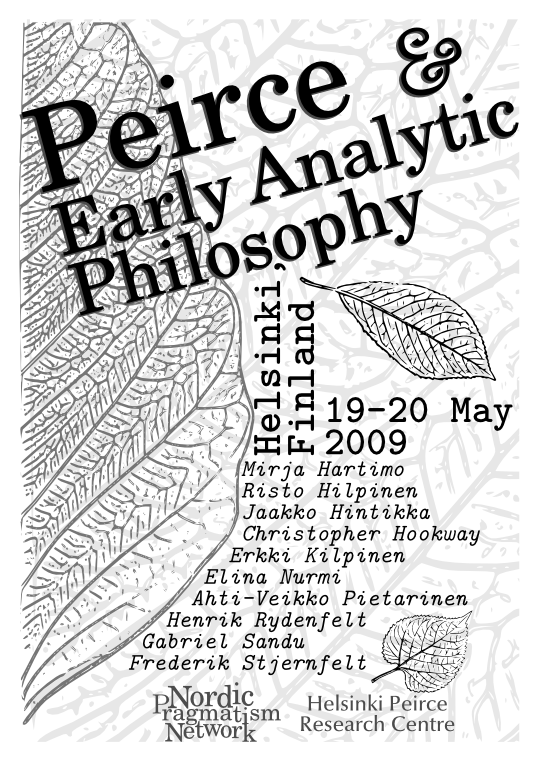 The symposium is arranged by the Helsinki Peirce Research Centre at the Department of Philosophy of the University of Helsinki, Siltavuorenpenger 20 A. The event is sponsored by the Nordic Pragmatism Network. The symposium sessions take place in room 334d, Department of Philosophy, Siltavuorenpenger 20A, 3rd floor. Research seminar sessions in the evenings are scheduled in room 222, 2nd floor. Participation in the symposium is open to all interested and free of charge. Please check this webpage for updates and more information about the programme. Copyright © 2003-2004 University of Helsinki. All rights reserved.